“Wicked’s” triumphant Chicago return is via one of two national touring companies of the 2003 Broadway blockbuster, and it still proves itself to be a well-oiled machine that delivers a heady dose of theatrical spectacle and touching storytelling. 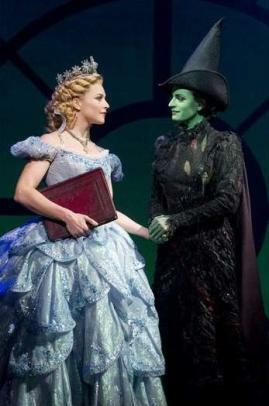 Aside from minor physical changes, “Wicked” retains director Joe Mantello’s staging magic in depicting a revisionist take on “The Wizard of Oz.” And it’s all lushly illustrated throughout by Susan Hilferty’s whimsically plush costumes and Kenneth Posner’s color-saturated lighting design. This “Wicked” cast is also uniformly strong, with some members finding small ways to break out of the vivid templates of the show’s many memorable predecessors. Read complete review by Scott C. Morgan at Chicago Daily Herald. Showtimes: Schedule varies through Jan. 23, but most performances 7:30 p.m. Tuesdays through Thursdays, 8 p.m. Fridays and Saturdays, 2 p.m. Wednesdays, Saturdays and Sundays. No shows Dec. 25 or Jan. 1. This entry was posted on Monday, December 6th, 2010 at 1:11 am	and is filed under Uncategorized. You can follow any responses to this entry through the RSS 2.0 feed. You can leave a response, or trackback from your own site.